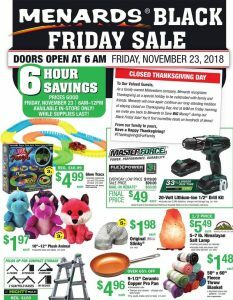 View Menards Black Friday 2018 Sale Ad. Black Friday Store Hours: stores will be closed on Thanksgiving Day, and open from 6AM until noon on Friday. Featured Menards Black Friday Doorbusters: $49.99 Master Force 20V Lithium-Ion 1/2-in. Cordless Drill Kit; $1.99 Flying Stuffed Animal with Sound; $9.99 Stanley 3-pc. Locking Pliers Set; $29.99 Stanley 150-pc. Socket Set; $169 Snap-On Electric 2000 PSI Pressure Washer; $28.88 Sharper Image HD Action Camera; $9.99 Extreme Pro Charger Kit; $29.99 iLive Blue Undercabinet Music System; $1.89 Licensed Character Socks; and more.